ON DETACHMENT AT LANGELEBEN – JULY 1957 MIKE MILLER ! At the beginning of November 1956, most of the February 1956 Army intake to the Joint Services School for Linguists left the former naval air station at Crail near St. Andrews in Scotland on the gruelling overnight journey to the Intelligence Corps depot at Maresfield. Having completed our nine months course in Russian we then had to endure a desperately uncomfortable winter in wooden huts, coping with ‘bull’ and fatigues in a ‘you’ve had it cushy’ regime, before those who had desperately volunteered for a posting made it in March 1957 via Harwich and the Hook of Holland to No.1 Wireless Regiment at Birgelen. 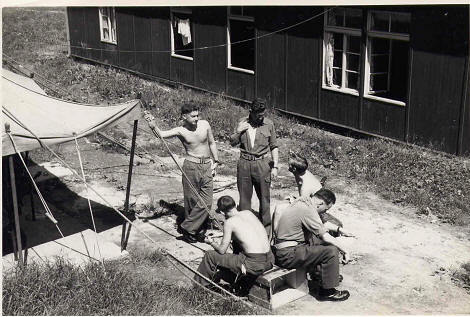 What luxurious barracks they were after the privations of Maresfield with central heating, integral ablution facilities, constant hot water for baths and showers, good food and plates that didn’t have to be carried away and washed up in filthy galvanised iron tubs. Although we were technically ‘Joskins’ - Just Overseas Skins -, we possessed the rather more formidable cachet of also being ‘Peachy’, by having less than six months to do. We were very quickly introduced to our duties by a Russian speaking Australian Captain from the Royal Tank Regiment and settled down to the comfortable routine of monitoring, operating a shift system, which after every five days gave three days off, which were used almost universally for exploring Holland, where hitch-hiking was a doddle, living was cheap and travel for NATO servicemen on the excellent railway network was half-price. Then for some unknown reason, because I was not actually a particularly proficient voice op, I was selected at the beginning of July to go with a few others on detachment for three/four weeks to 101 Wireless Troop at Langeleben. With so much information filtering back about its hedonistic delights, I jumped at the chance. Having adopted Royal Signals flashes and badges, the advance party of four travelled by train to Brunswick with instructions to install themselves at Langeleben, then pick up a radio truck plus generator and drive out towards the East German border to find a suitable location for good reception. The following Saturday at the crack of dawn, three of us drove out of the camp at Birgelen in an open Austin Champ, picked up the autobahn somewhere near Duisberg and eventually arrived in the centre of Brunswick around 4pm with a thimbleful of fuel left in the tank. As I could speak some German I was instructed to accost two passing uniformed members of the newly formed Bundeswehr, to seek directions to the barracks of the East Surreys. They saluted me smartly before pointing the way and amazingly on a Saturday afternoon, we found a duty storeman to man the pump and fill our tank. Three quarters of an hour later we arrived at Langeleben. Our advance party had been accommodated in a large tent next to the MT shed but not being a Boy Scout by inclination, I managed to find within the L shaped hutted complex a spare berth in the drivers’ room, which they were quite happy for me to occupy. We very quickly experienced the exhilaration of the ten minute evening run at breakneck speed down through the woods to Königslutter in the back of a three-tonner, surely the tarmac equivalent of white water rafting or the Cresta Run, to be deposited unceremoniously outside Schumanns with the rest of the revellers plus the camp dog, all eager for refreshment and entertainment. ‘Spanner’ was a dog of uncertain pedigree but had a prodigious capacity for beer and on entering the bar each evening was presented with a bowl of the local brew and truly it is the only time that I ever saw a dog weave and totter slowly from side to side on its four legs as it crossed the room later in the evening. After fifty years I can dimly recall pretty girls, a massive jukebox pumping out Elvis Presley and Little Richard with Earl Bostic’s caustic version of ‘Flamingo’ lately coming to mind and in the wee small hours the duty driver tooting the horn of the pick-up truck, parked dangerously on the bend outside the pub. On one occasion half-way back to the camp, there was a frenzied shout of: ‘We’ve left the f……ing dog behind!’ Furious banging on the roof of the cab eventually resulted in a rapid return run to Schumanns, the knocking up of the landlord, and the retrieval of ‘Spanner’ who was lying comatose under a table in the bar. Following the return to camp there was the traditional 2am fry-up over the still glowing solid fuel cooking range. Our advance party had informed us that there was good news and even better news. The good news was that they had found the perfect spot overlooking the border for the radio wagon, which was now parked sedately amid shrubbery outside the beer garden of the Elmhaus Gasthof just off the Schoningen road. The better news was that the generator had broken down and was currently being towed back to Birgelen for repair or replacement and therefore we would be without power and unable to work for about three days. It truly was an idyllic spot, accessed by a long straight tree lined avenue and fifty years on nothing much has changed. There we stayed, reading, sunbathing, chatting with the locals, smoking NAAFI Rothmans, Woodbines or Sobranie Black Russians and drinking beer in the pub garden, relieved in shifts from time to time by a shuttle run from the camp. There were boxes of emergency rations and a stove, so we were able to prepare simple meals and brew up. On the night shift we slept in the wagon, with flares going up over the other side of the border – somewhat disconcerting, particularly as our vehicle had a flat battery and in an emergency would be firmly rooted to the spot. We even had a visit from an Allied Control Commission patrol in their naval type uniforms and supplied them with cups of tea. Eventually the generator, which had to be painfully hand cranked, re-appeared and we were able to do some work. A fortnight or so later the adventure came to an abrupt end. Early one Saturday morning two of us were being driven in an Austin 1 tonner to the Elmhaus to relieve the night shift. As we came round the bend and down the hill to the Rabke crossroads, an offside wheelhub connected, possibly as the result of a burst front tyre, with that of the Rabke 3-tonner coming slowly up the hill in the other direction. We tore out a concrete post and ended up against a tree buried deep in the woods on the opposite side of the road, while the other vehicle had done a sickly 90 degree turn to port and was stranded like a wounded buffalo in the middle of the road, with its steering system totally wrecked and spewing out water, oil or brake fluid. Miraculously injuries were confined to bruises and scratches, although I still have the scar on my forehead where I connected with the windscreen. I think a passing German motorist must have alerted the camp and eventually some very antagonistic Military Police turned up, together with a heavy recovery vehicle from Helmstedt and we were ferried back to camp. Abrasive and unsympathetic interviews with the redcaps followed and statements were taken but unfortunately it marked the premature end of our detachment, as about one third of the camp’s vehicles had effectively been incapacitated. A day or so later we were dropped off at Königslutter station, changed trains at Hannover and eventually got back to Birgelen. We pushed on towards our demob date at the end of August and the night before our departure had a monumental celebration at the Burg Hotel in Wassenburg. Mid-way through the following morning as we were in the last throes of packing, a runner came looking for Private Miller with an immediate summons to a Regimental Court of Enquiry. As was the custom of those days, we had all ceremoniously ‘distressed’ our equipment – best boots had been reduced to something akin to miners’ footwear, with the rest of our equipment showing very little evidence of either blanco or Brasso and I was therefore somewhat apprehensive as I hurried across to the Regimental Headquarters. The RSM did a double take as he marched me in before the CO and the enquiry panel to give my account of how £350 of damage – or thereabouts – had been caused to two Army vehicles. Struggling to remember the contents of my statement and being still somewhat jaded from the previous night’s proceedings, I stumbled through my evidence conscious all the time that if the enquiry was at all protracted, I was going to miss the demob truck to the station. I was dismissed just in time to make it to Dalheim and I never did find out the result of the enquiry. There is however a very sad postscript to this tale, which I only found out about in 2003. Our driver, a L/Cpl in the Signals, was some time later a very sick ‘flu’ patient and was being taken to hospital on a stretcher in an Army ambulance, which in the prevailing wintry conditions was involved in a serious accident. He was severely injured, suffering spinal damage and died some months afterwards. Not all beer and skittles at Langeleben. The 1960s saw a hardening of Cold War attitudes culminating in the building of the Berlin Wall in August 1961. Langeleben was of course party to all this; sometimes rather too close for some peoples' comfort, such as the time it was realized that Soviet tanks from 26 GTD were moving towards Helmstedt, or the buzzing of the Räbke DF site by a hostile helicopter. On a more personal level, Jim H...... recalls the sight of grown men in tears on hearing the MoD announcement that National Service was to be extended in certain key deficiency trades! The last National Serviceman, Bob C......., left Langy in 1963. The ops wagon had by now given way to a permanent ops block, comprising a number of sectioned off areas, one of them containing wall to wall electronic equipment. This windowless dungeon was known as 'the sweat box', and in the days before compulsory fitness tests, a few shifts in that hell-hole during warmer months ensured that few people became overweight! Courier runs to the American site at Bahdorf (today occupied by the French Forces) were undertaken in an olive green VW Beetle, driven by regular and conscript members of the MT, either hell-bent on beating the record for the fastest round trip, or wishing to terminate their service prematurely! That nobody was killed or even injured, thinks Jim H......, is a testimony to the excellent driving skills of the MT. Perhaps the highlight of the 1960s as far as the inmates were concerned was the building of long- overdue modern accommodation. When the'New Camp' was built in 1963-4, 2 Squadron, 13 Signal Regiment were in occupation of what must have been the showpiece barracks of BAOR. The modern single men's' accommodation is still far better than that which many soldiers today occupy. Each accommodation block contained four x four-man rooms, six x NCOs single bunks, with self contained bathrooms, showers, toilets and drying rooms. The Officers' and Sergeants' Messes, the only two storey building on camp, shared a kitchen, but had separate dining rooms and single rooms for the living-in personnel. The NAAFI was light and spacious, with bar, canteen and recreation rooms. A superbly-equipped gymnasium was also provided. The Squadron offices were housed in a commodious single storey building, with the SSM's office on the corner enjoying a view over most of the camp. A water tank was provided in the centre of the camp, which was very quickly turned into a swimming pool - a most popular facility in summer - and one made use of for ducking Squadron members on birthdays, demob parties, barbecues etc. To round off the effect, the remaining open spaces were grassed over and landscaped, creating a real jewel of a camp in a picturesque setting. The camp also acquired a name, that of Anderson Barracks after the then Signal Officer in Chief, Major-General Anderson. However, although this name appears in official documents, the camp, as before and after has always just been referred to as 'LANGELEBEN CAMP' or just plain 'LANGY'! In 1967 13th Signal Regiment was reorganized. Those serving with 2 Squadron at LANGELEBEN were given the option of returning to Birgelen, transferring to 223 Signal Squadron at Winchester, or remaining at Langy and joining the new incumbent unit - 225 Signal Squadron. 225 had had a chequered history as the 1st British Corps mobile EW squadron. The Squadron was formed in 1958, serving at Birgelen from June 1958 to June 1964, when it moved to Scharfoldendorf, on the "Ith" feature south of Hannover. The Squadron took over the dual role of manning the Langy setroom and retained its mobile role for 1st Corps. As the garage space at Langy was so limited, most of the Squadron's vehicles were housed with the local armoured reconnaissance regiment at Wolfenbüttel. When Bill F.. moved up from 'Scharf' the regiment was the Queen's Royal Irish Hussars, and remarks were heard that this was an education for both sides. Bill lost count of the number of radios he repaired by changing the green issue batteries for 'Ever Readies' but it stood him in good stead for at least one St. Patrick's day in their NAAFI. 225 brought with them many things, not all of them bad. One artefact is the Scharfoldendorf Bell, which used to grace the guardroom at Scharf, then later outside the Langy Officers' Mess. It now stands outside the WOs' and Sgts' Mess in Celle. Its gleaming appearance is a tribute to the many 'janker-wallahs' who have polished it over the years! After his visit to the Königslutter re-union 2007 all the way from Australia Richie sent a couple of memories, one of which was typical ’Langeleben’. On one occasion the	material was securely packaged as usual - sealed in a metal box and then secured inside a green VW Beetle which was then driven at high speed to Bahrdorf by a member of the MT accompanied by an Int Corps shift worker, whose attire was the light green fatigues known as ‘denims’ in which we lived and slept, Approximately 2 hours later a US military vehicle plus driver and accompanied by 2 heavily armed MPs with immaculately polished boots and shining helmets arrived at Langeleben and presented us with an impressive secure container which contained (wait for it) a RECEIPT for the material we had sent them 2 hours previously! As Editor may I add some comments on the courier ‘business’? Typical of the British Army was the fact that during the Fifties the courier team consisted of a driver (usually mad in my experience) and a member of the Intelligence Corps. Looking steely eyed – well, as near to it as you could – you were driven through these narrow lanes at breakneck speed nursing your sten gun ready to fight off whoever was likely to attack you. The only problem was that we were never issued with any ammunition! Ever since then I have looked upon ‘Armed Guards’ with some suspicion. The second story which Richie thought was very amusing and which could never have happened in the days of National Service commissioned officers. Capt Dan Bailey did a stint at Langeleben some time between 1963 -1967 and was for a time billeted in the Naafi quarters close to the gymnasium. A shift worker on the '5 to Mid' took a phone call to the effect that 'a Capt Graham' had arrived at Braunschweig station and required transport to Langeleben. At that time in the evening the duty driver was unavailable (usually delivering squaddies to and from the local bars) and other members of the MT were non compus mentus. The enterprising shift worker decided that Capt Bailey would be only too delighted to pick up a fellow officer so he was roused from his slumbers and dispatched to the Bahnhof in Braunschweig. Imagine his amazement when he was greeted by Craftsman Braham (at the reunion recently) who in his inimitable Irish brogue said "Thanks very much, Sir". ‘I did in my 2 stints in Langeleben circa March 61 to April 62; then July 63 to May 67. Work could be very hectic during the oppositions' exercise periods and one felt a great sense of achievement in seeing this work translated into the End Product Reports which went to the International Agencies. Having spent the last 18 months of my military career visiting the former Soviet Union and Central Asia plus the Baltic republics and seeing, in various places, rotting military hardware and nuclear subs rusting at anchor because the authorities could not afford the electricity, he had to wonder whether the whole thing i.e. the Cold War was just a total facade perpetrated by the arms industries on both sides of the divide. There is no doubt that the FSU and its allies had the capabilities to inflict huge damage on the West BUT did it have the INTENT’. I arrived at Langeleben under something of a cloud. Well, for me, it was meant to be something of a punishment posting. Not that I was a bad lad I had just managed to get off on the wrong foot from the start. This continued as I got off the train at the wrong station and found myself at Königslutter East. A kind taxi driver took me up to the Camp whilst the driver was still waiting for me at the right station. The Adjutant Lt. Aitkin, a big lad, wasn’t at all happy! (I even dated his daughter for a while but that is another story to come later). This so-called punishment posting turned out to be the best of my Army career. There was the lovely journey to work in Wolfenbuttel which was a pleasure and so was going into town where I met the love of my life but she unfortunately was already engaged. Females there were though in plenty and being single and with my own car I was always being asked to make up a ‘foursome’ with some of the Wives and their sisters and friends who came out to stay. Being a complete gentleman, how could I refuse? My passion was sport and I certainly had plenty of this with the great Langeleben football team – ‘Brummie’ Andrews, Ian Ellinor, David Whittaker, ‘Gypo’ Brookes just to name a few. We won the ‘Minor Units Cup’ and with Langeleben being such a small unit this was a fantastic achievement! I also played for the local Helmstedt Hockey team where I was so well liked that they said they intended buying me out of the Army and finding me a job locally should a posting come through for me from REME records. Even Our C.O. played for the same team and he asked REME records if I could stay on. Alas, back came the answer “NO”. Funny moments? There were a lot of them. One day I got chatting on the phone to the lady at the Wolfenbuttel telephone exchange and I got round to asking her out and she asked me back to lunch at her Parents’ house. You can imagine my surprise and that of Capt. Atkins, when I walked in through the door. (Thanks Wendy). Mind you, I got my ‘Corporal’ soon after that. Graeme Atkinson (who was later to become Yeoman) and myself were ‘waitering’ at the Sergeants’/ Officers’ Mess one evening when they were holding a Dinner/Dance. After helping out with the left-overs and a lot of wine we though it would be a good idea to be in first for breakfast. We got our sleeping bags and camped out in the Cookhouse. We never made breakfast. So much for it being a ‘Punishment Posting’, actually it turned out to be the best ever as far as I was concerned. I met some fantastic mates. Bob Kay and Ron Mason I still see to this day and I still see the woman who was the love of my life. She has been over to see us from Königslutter and there is still a great friendship after all of those years. We met up again at the last Langeleben Re-union. I joined up as a Regular in Sept '55 and did my square bashing at Gallowgate Camp up in Richmond. That’s when I first met Tom Neal. Since I could already read morse at speeds in excess of 15 words a minute and knew how to use D/F equipment and had requested the job of a Spec Op (my uncle was one during the war) I was a bit of a rare bird. One other chap in our intake by the name of Tony Oram (came from Balham) was in the same position. We both had learnt our trade at sea, he in the Merchant Navy and me on a trawler out of Grimsby, my home town. Did my trade training at Garats Hay with the rest of the lads and I seem to remember that Tom used to come home with me at weekends as his family were serving abroad. We had a chance to pick our postings of Austria, Cyprus or Germany. We nearly all got Germany!! Off we went to 1 Wireless Regt. at Birgelen but I didn't last there very long. Don't know if my reputation regarding the D/F thing had followed me but after a matter of weeks I was taken (by SSM Boston) down the road to the local outstation at Effeld(?) and given a few days of intensive instructions. I was pleased as I seemed to spend all my time in the setroom on the group RMBB 00201 which churned out five letter groups at a rate of knots (that brings back memories for me too. Ed). I seem to remember that it was the only group where you had help resetting your carbon papers!! After a few shifts down the road I was posted up to RAF Handorf just outside of Munster and spent a few happy months there until someone realised that we had an extra D/F Op which meant our shifts, although erratic, were less than at the Regt. It was between Christmas and New Year '56 when the door of our billet was opened with a hell of a crash and there stood SSM Boston. This guy was beginning to haunt me or so I thought. “Pack your kit Sig. Keightley, you're coming with me” he said, or shouted; he never seemed to converse in an ordinary tone, even on the phone! I did not dare ask ‘where to?’ so I got my gear together at speed - as we could do in those days! Within an hour we were off, the Cpl i/c of our detachment was down the hut so, by the time he got back, I'd gone. I got into the back of a jeep with the SSM and a driver and off we went. I plucked up enough courage to ask where we were going and I was told ‘101 Wireless Troop!’ I had no idea who the hell they were but he did condescend to tell me that ‘our destination was Langeleben’. After what seemed a life time we finally arrived at the place I was to call ‘home’ 'till Sept '58. Yep, the first few nights were in tents but, strange to say, the cold never bothered me. After several trips to Norway Coast, Iceland and the White Sea in winter before I joined up it just seemed about the same. I managed to get hold of a pair of mutlooks (eskimo boots) and had long johns sent from home which made life quite bearable! Within a day of my arriving I was ensconced at Rabke and also promoted to L/Cpl (paid) but I never did find out why. The only time that I ventured into the R/Wagons was to stand in for the shift Cpl who had gone on leave or who wasn't available. A good job that it was only for a short while as I hadn't got a clue as to how things worked! I remember a few of the names of A Watch, where are you Geoff Pearce, Eggy Beavers, Jock Cunnion and Len Hill? I remember those lads from over 50 years ago!! I found the social life down town was very much to my liking. When home spent all my time at local dance halls so I spent my time in town at the D/Haus. Had a long liaison with a young lady called Eva who lived halfway down Shoppenstederstrasse (can't really spell it like that can they?) About that time I met Pete Ellis with whom I keep in touch to this day. Also, I remember the evening when we thought the Reds were about to invade and we all got ready to leg it! The sad time when one of the drivers lost both legs going to Rabke, I believe he was from Northern Ireland; it shook us all up. Spent more than a few evenings/nights down Rabke thinking that I was surrounded by the enemy and bunged those five rounds in the mag of that trusty 303!! Remember other long 5 to mids when female company used to visit me from 'slutter, all that way on a bloody bike!! Refused Christmas leave and probably had the best time of my life, the pics of Rabke hut and A watch bar are from my collection. Strange thing, when I finally went on leave, I did a couple of days at the Regt on D/F Control and went on leave with a bloody heavy bit of radio kit to deliver to Garats Hay and was given two extra days. On my return I went straight back to Langy, but never did find out who I had to thank for that! I finished off my service at Langy, as I say, in Sept '58 and got sent to Saighton Camp in Chester for demob.